Well, things have been a bit hectic here. For once, there is only one creature to blame- Gilbert. 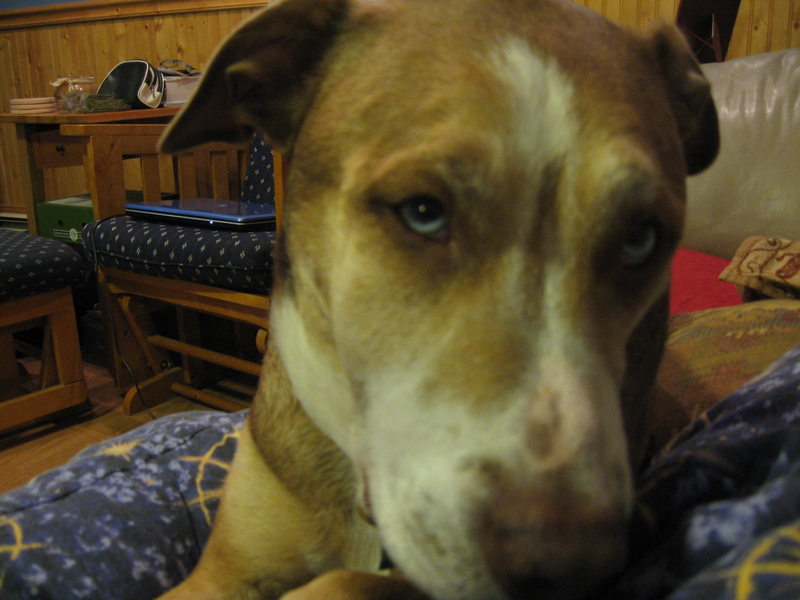 Gilbert’s an eight year old pit bull/’husky mix who joined our family seven years ago. Gilbert is… needy. Very needy. He constantly wants attention, and prefers to sleep next to me under the covers. He just constantly wants to be IN YOUR FACE. Gilbert’s also rather accident prone. He doesn’t just do stupid things (he’s not the brightest dog), he seems to attract problems. He developed a soy allergy. He regularly rubs his paws raw playing in the water, and then coming inside and licking obsessively. And lately, he’s been getting tooth infections. We do all the things you’re supposed to do to help your dog’s teeth- lots of good bones to help clean off their teeth, combined with occasional cleanings. But Gilbert’s a moron, and apparently this is just a pit bull thing, so he’s gotten a recurrent infection in one of his teeth this past year. We’d treated the infection the first three times, but with this current one, our vet recommended pulling the tooth. His tooth got pulled on Thursday, and he’s on a diet of mushy foods and antibiotics for the next week as the swelling gradually goes down. He’s back to his needy, crazy self already, but his face still looks pretty busted. This entry was posted in Dogs and tagged dog, gilbert, pit bull, tooth infection. Bookmark the permalink.